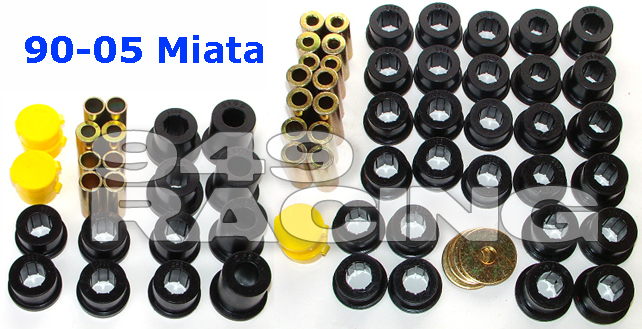 Prothane suspension bushings - Miata Turbo Forum - Boost cars, acquire cats. How are these different than Energy Suspension (other than being considerably cheaper)? Was thinking about doing urethane bushings over the winter. I remember in past 949 had only Energy Suspension stuff and it was in the order of $250 for a master kit. Now it's Prothane http://949racing.com/prothane-bushings-miata.aspx bushings at $199 for a master kit. it would seem the duro rating is different? I think the ES was 90 or 95A. I don't really know tbh, but I have the ES set, minus the sway bar bushings. I have ES, got em for 220shipped. Don't really know if there is much of a difference or not. Checked durometers and they match Bill's original request and Brian's data. Safe to say the ES will be the best peformance option. No idea on ride quality yet as I haven't gotten them in a car yet. Planning a test session in about 10 days at Streets of Willow. Any metal is 304 SS CNC machined. Uses copper-bearing lube if required (supplied) for installation. I have no idea which is better (mfr or durometer) for each application, but I do know polyurethanes have huge variations in properties available by altering aspects of manufacturing, so I'd be surprised if they were "all the same", even keeping durometer A equal. Last edited by Johnny2Bad; 10-20-2012 at 08:00 AM.